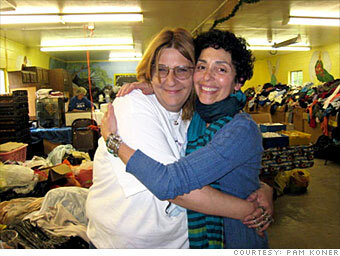  Nominate your "Hero of the Economy"
Hometown: Hastings-on-Hudson, N.Y., and West Orange, N.J.
For years Pam Koner has been known as the woman who matches families in need with good Samaritans. She finds people willing to shop for a foster family once a month, purchasing them a week's worth of nonperishable food plus one essential item such as winter gloves. The food is then packed up and dropped off at a location to be distributed. Through her program Family-to-Family, more than 700 families have been linked together. But Koner never expected she'd need to focus her efforts on her own town. Then layoffs began to hit the middle class-community in Hastings-on-Hudson, N.Y., and she knew she needed to take action. "I never expected it would be Hastings," Koner said. "I visited a family in Pembroke, Ill., and the house was dirty and moldy, with a single light bulb. You never think it'll be your backyard." Koner heard the food pantry in Hastings-on-Hudson was dwindling, families were struggling, and no one knew where to turn. Family-to-Family started organizing Hastings families to send boxes of food to their neighbors in need. Those accepting help are granted anonymity, so the community never knows who is down on their luck. The idea of one-on-one giving has hit others as well. Jaime Raskulinecz and her business partner, Linda Varas, adopted a family of five in West Orange, N.J., purchasing groceries and other necessities for them once a month. "Because of what's going on in the economy, we consider ourselves so much luckier than others," says Raskulinecz, CEO of Entrust Northeast, a retirement plan firm. "We're dong well. Clients are flocking to us because we administer non-traditional retirement plans. The stock market's misfortune has been our gain in the past few months." Over the holidays, Raskulinecz and Varas had gotten involved with an assistance effort coordinated by the Sunshine Fund, which provides families with presents and meals. That positive experience prompted them to ask the mayor of their town to suggest a family that they could take under their wing. "It's a sad situation for them," Raskulinecz says. Both parents take jobs where they can find them, but they are struggling. The mother had breast cancer a few years ago and is being tested for a recurrence. The hospital is providing them with charity care, but they still have to make monthly payments. "They are struggling. When we took them to Costco for the first time, it was a huge run, more than we had anticipated - they didn't have anything," Raskulinecz says. "Now when we go out, it's to make sure we are replenishing the staples. If more able families do what they can - even just $50 of groceries - it would make such a difference." -- J.P. and E.M.